Why would the resistor be after the LED in this project? This is project 2 of their official arduino projects book called "Spaceship interface". I understand resistors normally reduce voltage so the LEDs don't burnout but here 5v is coming from either digital 3, 4, or 5 and it seems like it goes right into the LED before going through a resistor as it goes back to ground. This makes no sense to me. It does not matter if a resistor is before or after a component, see the circuits below. The resistor reduces the current, and this is true for the path where the resistor is in (until the interconnections before/after the resistor). In the examples there is only one path. It doesn't matter where the resistor is located (before and after are meaningless concepts). What is important is that the resistor is in series with the LED. This produces an approximation to a constant current source (I = V/R). The actual current is lower due to the voltage drop across the LED, so is actually I = (V- VLED)/R. VLED varies; red LED is lower ~1.2V blue significantly higher. The resistor is to limit the current flow through the LED. A LED will burn itself out if given too much current and the maximum Arduino output current is 40 mA per leg (output). A quick calculation of V=I*R where V is 5 Volts, I = 40 mA leaves R = 5/.04 or 125 Ohms. You don't want to pull that much current from the Arduino so using 220 resistors is a safe bet at 22mA current draw per leg. That 10K resistor keeps pin #2 at the ground potential until the button is pushed. Then the input to pin #2 is 5 Volts. FWIW - that is an ugly drawing. Most single or RGB LEDs can't take more than 20mA without risking overheating/burning up. Modern LEDs need as little as 5mA to be really bright. I use 1K resistors on boards where the LED is being used as an indicator (like Power, or Rx or Tx active, or for the L (SCK activity) LED. Sometimes 2.2K when 1K seems too bright still. Depends on the LED. Test first before soldering thinks up. To calculate a resistor value for a desired current, use Ohms Law, V=IR, Voltage = current x resistance. Rearranged, Voltage/current = resistance. If you know the Voltage, Vf, of the LED when it is on, and you are driving from an Arduino pin that outputs 5V, then: (5V - Vf)/current = resistor. With 5mA and say a Vf of 2.5V: (5V - 2.5)/.005A = 500 ohm. You can determine Vf of an LED by using a 5V source and a 1K resistor. Connect the LED and resistor in series between 5V and Gnd. Measure the voltage across the LED, that is Vf. 5V - Vf = voltage across the resistor, Vr. 5V = Vf + Vr. If you know the voltage across the resistor, Vr, you can calculate current flow: Vr/resistor ohms = current Amps. Say you measured Vr of 2.7V and used a 1K resistor. Then current = 2.7V/1000ohm = .0027A, or 2.7mA. Not the answer you're looking for? Browse other questions tagged arduino-uno electronics or ask your own question. Why doesn't the LED turn on in this circuit? Why the 4.7 K Ω resistor in this pitch follower sketch? 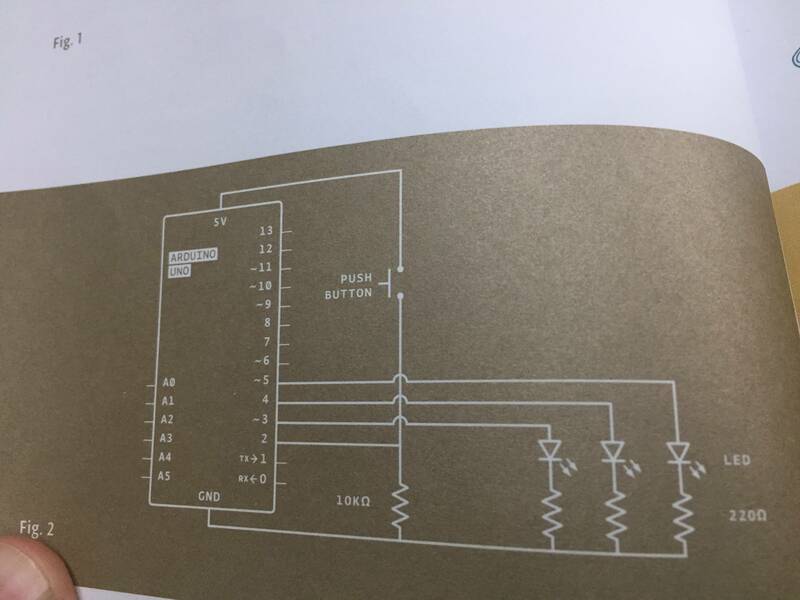 How can I understand the circuit diagram for Arduino Starter Kit Project 4? Is it common that Uno clones misbehave when connected to 12v on VIN?